A top International Monetary Fund official is offering Ukraine a generous gift: continued loans, even if it stops paying private creditors. It is, however, a trap of sorts. Accepting the deal risks undermining Ukraine’s ability to borrow on the open market and strengthening its dependency on the IMF. “If at some point Ukraine finds that it can’t continue to pay its creditors and meet the goals of the program, and it stops paying the private creditors, we have a policy called lending into arrears,” IMF First Deputy Managing Director David Lipton said Tuesday before talks with Prime Minister Arseniy Yatsenyuk of Ukraine and Finance Minister Natalie Jaresko. Jaresko started talks with creditors almost three months ago and got nowhere. Ukraine demanded a partial debt write-off. The creditors offered maturity extensions. The creditors’ stand is more logical. 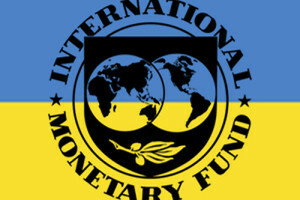 Jaresko and Yatsenyuk have insisted that the terms of Ukraine’s IMF bailout — $15 billion in savings from debt restructuring over 4 years , a debt-to-gross-domestic-product ratio of 71 percent by 2020, a gross refinancing limit of 10 percent of GDP for 2019-2025 — require a haircut for Ukrainian bondholders. The latter, led by the U.S. asset manager Franklin Templeton, countered that a maturity extension and a deferral of interest payments would satisfy the first requirement. As for the other two, the bondholders suggested waiting to define the terms until Ukraine has a better idea of what it GDP would look like in 2019 and 2020. Now, the economy is shrinking: Bloomberg’s consensus forecast from 20 economists’ predictions is a 6.75 percent decline this year. Yet the Ukrainian government says it’s pursuing ambitious structural reforms. Why doesn’t it expect these measures to spur fast growth, perhaps not this year or the next, but in 2017 and 2018? After all, the economy of Georgia, whose experience Ukraine is now trying to emulate with the help of that country’s former president and his team, grew 9 percent to 12 percent a year in 2005-2007 as a huge shadow economy was made legitimate. Ukraine has a shadow sector that accounts for about 58 percent of GDP, so growth potential is comparable. By saying that keeping debt to 71 percent GDP requires a write-off, the Ukrainian government is admitting that it doesn’t believe that efforts to eradicate corruption and get citizens to pay taxes will be successful. JPMorgan said recently that even now, it was getting harder to justify a haircut because of Ukraine’s higher than expected inflation and budget surplus. The IMF could privately point that out to Ukraine. Instead, if Lipton’s remark is anything to go by, the fund is about to deal a blow to the private creditors, making a moral and political point rather than a financial one. After all, bondholders lent to Ukraine’s previous, monumentally corrupt governments, and knew they were taking a big risk. And Russia, which owns a $3 billion Ukrainian bond maturing at the end of this year, has wreaked so much havoc in Ukraine that its claim is egregious. The fund’s lending into arrears policy was first adopted in 1989, precisely so debt holders couldn’t use the IMF’s ability to provide assistance as leverage against debtor countries. So Ukrainian bondholders, especially the funds managed by Templeton’s Michael Hasenstab, should be more malleable if the IMF keeps pumping money into that country, even if it makes good on its threat to declare a moratorium on private debt payments. There would be no deadline for a debt deal and Ukraine would have an official sanction to default at will. If the IMF executive board agrees with Lipton, Jaresco can break out the Champagne. But Hasenstab will suffer his first big defeat in years of successful investment in distressed bonds, and Russia may never get its money back. In response to this new situation, Ukrainian bond prices have dropped from the high of 53 cents on the dollar they reached after JPMorgan’s note. The problem for Ukraine, however, is that failure to reach a negotiated solution with the private creditors will be a blot on the current government’s reputation. If it did a no-haircut deal, it could borrow on the market this year. If instead Yatsenyuk and Jaresko get a free pass from the IMF, they will look unreliable to prospective lenders. For now, IMF approval and funding, bolstered by bilateral aid from Europe and the U.S., is enough to keep Ukraine afloat. But what if its needs increase? Lipton pointed out that Ukraine’s economic restructuring is “half-completed and heavily challenged” by a corrupt establishment and predatory oligarchs. Suma Chakrabarti, president of the European Bank for Reconstruction and Development, praised the Ukrainian reforms in a recent speech but urged the government to be even bolder, particularly in fixing the oligarch-controlled banking sector. With so much work ahead, Ukraine would be wrong to fleece the creditors. A haircut isn’t necessary, though it may be needed in five years’ time. Make a deal that won’t antagonize the market is a test for Jaresko and Ukraine’s government.